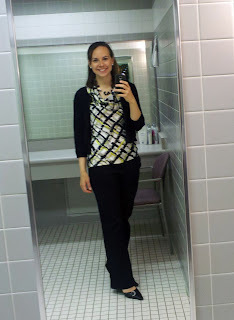 Oh hey, I finally took photos of all my outfits this week. Imagine that! It was nicer on Monday than it was on Friday. This is what happens when you have 80-degree days in March, I guess. 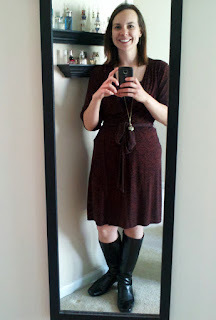 This dress is from Target via Goodwill and is a mock wrap dress. 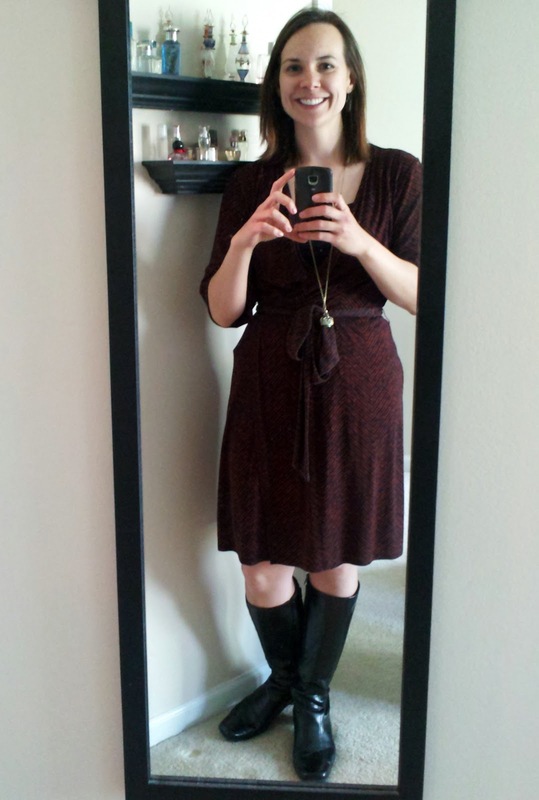 With black boots and a pendant from Forever 21. The weather was getting cooler, so I needed more layers. 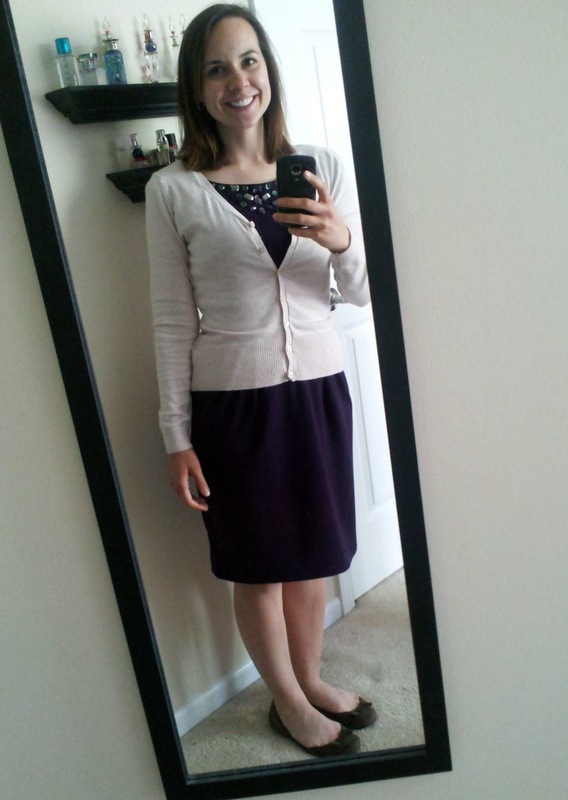 I went with a purple sheath dress from my mom, a button up cardigan from H&M and shoes from Nordstrom Rack. I actually took this cardigan in a couple of months ago when I started losing weight. All the tailoring I learned out of necessity. It's actually really easy to alter a sweater or cardigan - just try it on inside out, pin it to fit and sew along the lines. Cardigans are way more streamlined that way, too. Oh, the suit. My sad, sad little suit. This predates my weight loss and is looking pretty matronly on me. 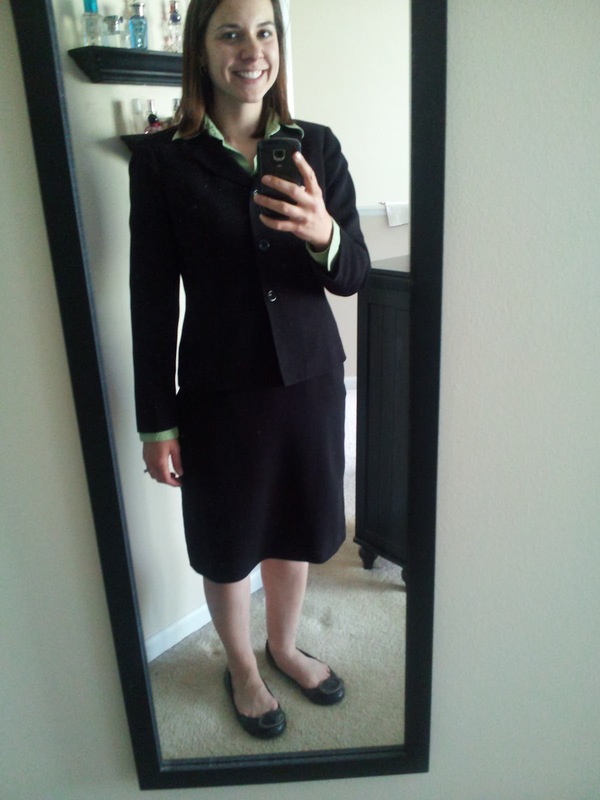 I had a meeting this week that I had to dress up for and I realized it's time to go suit shopping! This is the top Erin taught me how to wear. 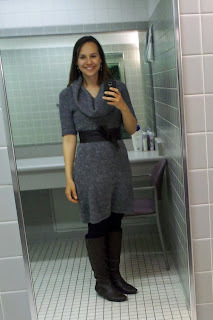 I wore it with an old cardigan that came with another dress, Banana Republic pants and clothing swap shoes. This is today's outfit. It was pretty cold, so I went with a gray cowl-neck sweater, my belt from The Limited, black leggings and my awesome brown boots. It's a flashback! 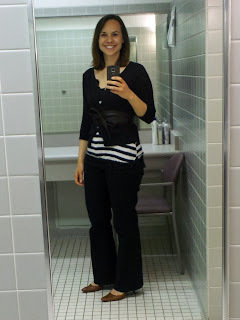 This is the outfit my phone ate last week. I was told I was looking very Parisian that day. It's a clothing swap top and shoes, Banana Republic pants, a Nordstrom Rack cardigan and a belt from The Limited. I love this week's outfits! I bet Erin would go suit shopping with you. I think all of hers are from The Limited. I was at the outlets last week and took a pic of an outfit I thought would look SO CUTE on you. Let me know if you want me to email it to you! I'd love it, send it along! I saw The Limited was having a sale this week, but I didn't get to the store in time. I just need a classic, basic suit, since I really only need one about three times/year.